Jaime García, son of renowned José "Don Pepín" García, has been involved in the cigar industry for much of his life, helping his father with various projects and being naturally enmeshed in the family business. 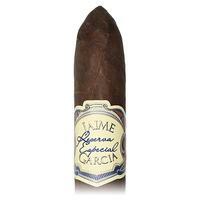 Now, though, the younger García has headed his very own line: Jaime Garcia Reserva Especial. 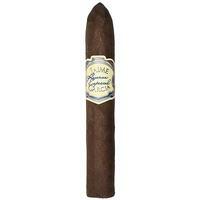 These sticks start with a dark, leathery Connecticut Broadleaf Maduro wrapper. Inside you'll find long-fillers from some of the García family's farms in Nicaragua, married to an Ecuadorian binder. Made with the care and quality we've come to expect from the My Father Cigars factory, these cigars offer a flavor profile marked by pepper and spice with hints of coffee and chocolate, making this Belicoso quite the pleasant, medium-bodied smoke. 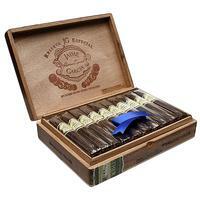 5% Off Five Sticks: $6.93 ea. 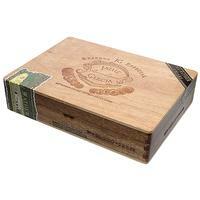 10% off box (20): $6.57 ea.